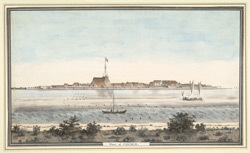 Water-colour painting of the fort of Cochin, from across the backwater by an unknown artist, c.1800. The image is inscribed: 'View of Cochin'. Cochin (now called Kochi) is situated on the Malabar coast in Kerala, southern India. The name probably derives from kocchazhi meaning the new or small harbour. In the 15th century the area attracted Christian, Arab and Jewish settlers from the Middle East and from 16th century onwards, the Portuguese, Dutch and British competed for control of its port and the lucrative spice trade. The Portuguese fort was built in 1503 and contains many historic buildings set in winding streets.